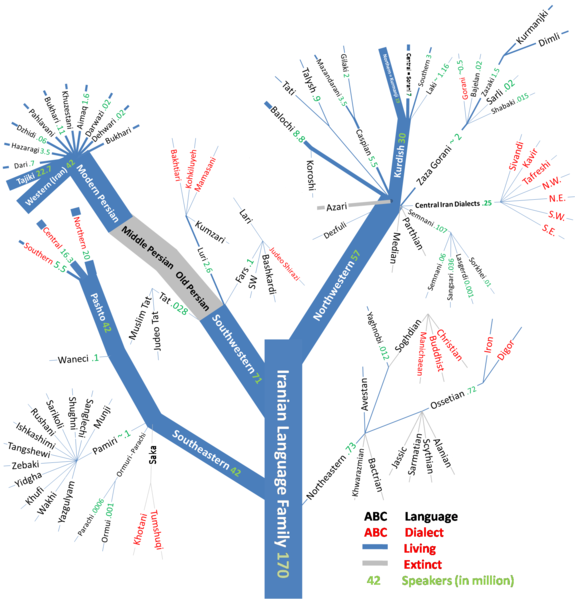 Home » Morphology » What Is a Synthetic Language? 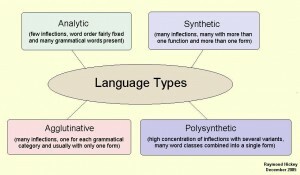 As noted in my earlier post, the term “synthetic” has been used in several confusing ways: sometimes it is used to refer to any language with a high morpheme-per-word ratio, with the opposite pattern of a low morpheme-per-word ratio referred to as an “isolating language” (or “analytic language”), and sometimes “synthetic” is reserved for a specific subtype of non-isolating languages, in contrast to not only isolating but also agglutinative and polysynthetic languages. 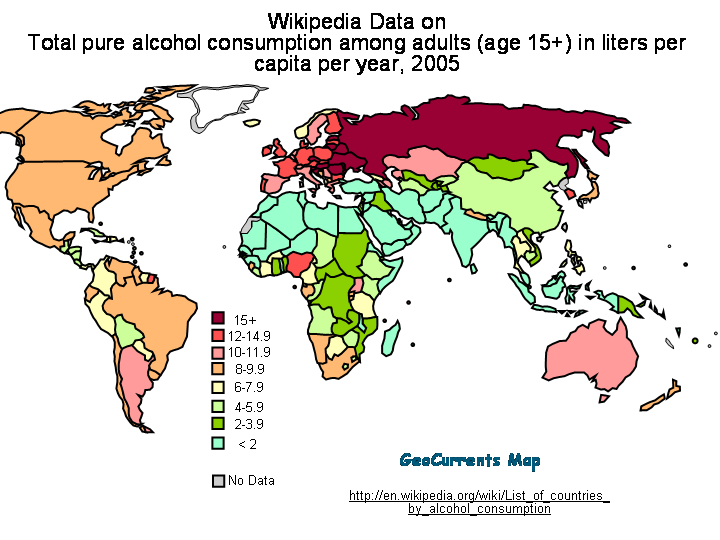 The term “synthetic” is used in the former sense in the Wikipedia article titled “Synthetic language” and in the latter sense in the chart by Raymond Hickey, reproduced on the left. “Synthetic” in the latter sense is also interchangeable with “fusional” (and for clarity, I should have used it in my discussion of Strunk & White’s The Elements of Style). 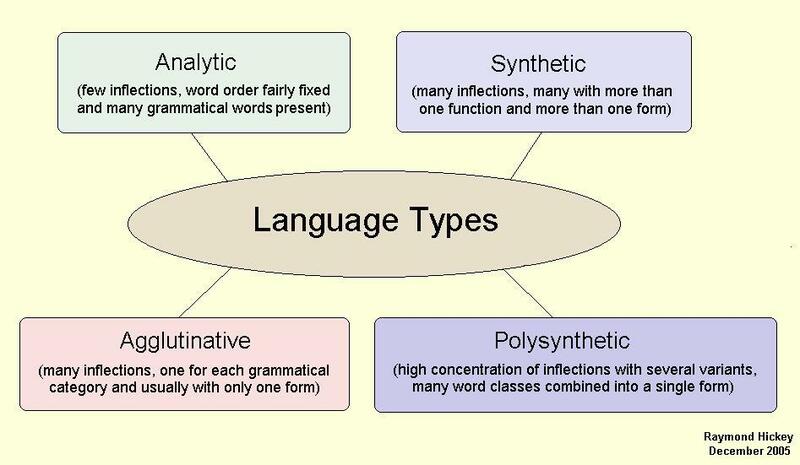 Moreover, it is better to talk about isolating, agglutinative, fusional (or synthetic), and polysynthetic models rather than languages, as a given natural language may find itself somewhere in between these prototypical morphological models. 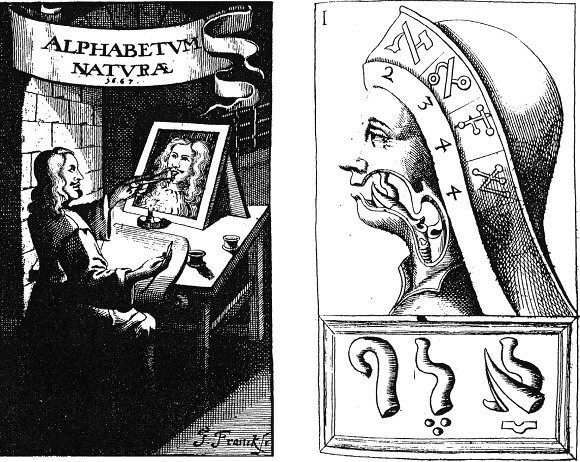 For example, English—whose historical roots are in the fusional model—exhibits some elements of isolating morphology. Mandarin Chinese, which is often cited as a prototypical example of an isolating language, has developed elements of agglutinative morphology. In what follows, I will clarify what each (idealized) model is like, before examining the three languages that David asked about. To start with the isolating model, it means that grammatical features such as tense, aspect, or agreement (on verbs) and number and case (on nouns) are expressed through free-standing words. * As mentioned above, a frequently-cited example of the isolating model is Mandarin Chinese, where the plural form of the noun ‘dog’ is achieved not by adding a suffix—as in the English dogs—but by adding a quantifier (‘several’) and a classifier (‘item’), as in ‘several item dog’ (cf. the English several grains of rice). In contrast, in the agglutinative and fusional models, such grammatical features are expressed through morphemes—suffixes or prefixes—that attach to the verb or the noun. The main differences between the agglutinative and fusional models concern how many features each morpheme expresses and how much interaction occurs between the neighboring morphemes. In the agglutinative model, each morpheme expresses only one grammatical feature and there is little interaction between morphemes. To express more than one grammatical feature (such as number and case), multiple morphemes are strung one after another into long strings that are words. In the fusional model, a morpheme typically expresses several grammatical features at once; moreover, when morphemes attach to the stem, they affect the pronunciation of each other. Let us examine how this works in an agglutinative language, Tatar, and a fusional language, Russian. Take, for example, the genitive (“possessive”) plural form of ‘child’. In Tatar, it is a three-morpheme bala-lar-nıŋ ‘of children’ (hyphens indicate breaks between morphemes), whereas in Russian it is a two‑morpheme det-ej ‘of children’. The difference in the number of morphemes comes from the fact that in Tatar the plural number and the genitive case are expressed by separate morphemes, ‑lar and ‑nıŋ, respectively, whereas in Russian both things are expressed simultaneously by a single morpheme, here -ej. Moreover, in Tatar the plural is always –lar and the genitive is always ‑nıŋ (except for adjustments due to vowel harmony, which are ubiquitous in the language and do not concern these specific morphemes). In Russian, in contrast, the genitive plural may be expressed by the suffix –ej, as in the example above, or by –ov, as in kot-ov ‘of (male) cats’, or by a zero morpheme, as in sobak-0 (where “0” indicates a zero morpheme) meaning ‘of dogs’. The choice idiosyncratically depends on the noun itself. If you want to speak Russian, you just have to learn which nouns go with –ej, or –ov, or “0”, and the same for all other number/case combinations. Nor is it always the case that a root affects the choice or pronunciation of a suffix in a fusional language. For example, in Russian the suffix -n, which forms adjectives out of nouns, affects the pronunciation of the last consonant in the root, turning the /k/ in ruk– ‘hand’ into [tʃ] in ručnoj, the /g/ in sneg– ‘snow’ into [ʒ] (as in the middle of the English measure) in snežnyj, and the /x/ in pux– ‘down’ into [ʃ] in pušnoj. As is evident from words like kniga ‘book’, gnu ‘gnu’, and xna ‘henna’, the combinations of /k/, /g/, and /x/ with the following /n/ are not themselves a problem, and it is the adjective-forming suffix that determines these changes. So what about Esperanto, Latvian, and Hebrew? Esperanto is mostly agglutinative, as discussed in detail in my earlier post. For example, the nominal plural accusative string -ojn can be decomposed into the noun marker -o, the plural marker –j, and the accusative marker -n. The latter two also appear in the adjectival plural accusative string -ajn; the corresponding singular form will have -an and the nominative plural on adjectives is -aj. Hebrew is a trickier case, as it combines elements of fusional morphology with the non-concatenative (or “root-and-pattern”) morphology, characteristic of Semitic languages. For example, the verbal form katav-nu ‘we wrote’ contains a root (√K-T-V), a past tense morpheme CaCaC (“C” means a corresponding consonant of the root), and a 1st person plural suffix -nu (cf. 2nd person plural katav-tem ‘y’all wrote’). In contrast, future tense forms appear with person/number agreement prefixes rather than suffixes, as in ni-xtov ‘we will write’, ti-xtov ‘you (male) will write’, etc. (The change from /k/ to [x] is a result of another general sound change, known as the Beged-Kefet rule.) While verbs play by the non-concatenative rules, nouns in Modern Hebrew do not: unlike Modern Standard Arabic, it does not have the so-called “broken plurals” (e.g. Arabic kitāb ‘book’, kutub ‘books’—what changes is the vowels in between the consonant of the root √K-T-B). Plural and feminine forms of nouns in Hebrew are formed by adding suffixes, as in xaver-0 ‘boyfriend’ (with another zero morpheme! ), xaver-a ‘girlfriend’, xaver‑im ‘boyfriends’, xaver-ot ‘girlfriends’. Latvian, like Russian, is a (mostly) fusional language. For example, number and case are expressed on nouns by a single morpheme: nominative singular of ‘man, husband’ is vīrs and the corresponding plural is vīri—rather than add a separate plural morpheme before or after the case morpheme, the -s expressing both nominative and singular (and also declension, if we are to be precise) is replaced by the -i expressing both nominative and plural. Similarly, no common plural morpheme can be identified across plural forms in different genders: vīri (nominative plural), vīru (genitive plural), vīriem (dative plural), vīrus (accusative plural), vīriem (instrumental plural), and vīros (locative plural). *Grammatical meanings can also be expressed on adjectives, including comparative and superlative, as well as number, gender, and case (in languages where adjectives agree in those features with the nouns they modify).